People often say "what gets measured gets improved," but they rarely say what, exactly, should be measured. With the recent developments in the reporting capabilities of IT help desk software, hundreds of KPIs and help desk metrics can be measured and monitored. But that doesn't mean you should measure them all. Only the KPIs and metrics that are critical to your IT help desk need to be measured to improve service delivery. The number of hours the business is down because IT services are unavailable. Keep lost business hours to the bare minimum. Most IT teams track service availability to see the overall performance of their IT service desks. But the pain of lost business isn't always refl ected in service availability levels, even when those levels are high. For instance, if service availability is at 99.9%, the company still loses more than eight hours per year. Tracking lost business hours clearly highlights the loss and its impact on business. In September 2010, Virgin Blue faced what could be considered every airline's worst nightmare. About 50,000 customers and 100 fl ights were grounded . Four hundred more fl ights were delayed or rescheduled over the following days because the solid-state disk server infrastructure hosting Virgin Blue's applications failed. This affected Virgin Blue's online check-in and booking system. Despite SLAs to restore services immediately, it took 11 hours for the service to be restored, and 10 more hours to restore full operations. This was because of an attempted repair of a faulty device, which delayed the switch over to a contingency hardware platform. By then, the damage was already done. Although these 11 hours didn't cost much in terms of Virgin Blue'sIT service availability for the year, they cost Virgin Blue approximately $10 million in terms of lost business. Proper planning and execution of application upgrades, server migration, and any IT change implementation process. Having a clean and well-defined CMDB to identify critical failure points and understanding CI interactions in the network to identify the cascading impact of failed changes. Educating IT teams on the risks of SLA violations in terms of lost business hours and revenue. Gain insight on anticipating and handling outages by evaluating the past performance of the IT help desk. That said, a lot of factors could contribute negatively towards lost business hours. In 2010, Gartner projected that, "Through 2015, 80% of outages impacting mission-critical services will be caused by people and process issues, and more than 50% of those outages will be caused by change/configuration/release integration, and hand-off issues." Achieve a higher percentage of successful change implementations. Opinion remains divided on what a failed change implies. It basically refers to any change that did not meet its objectives or go as planned. On October 27, 2011, trading had to be halted at the Australian Stock Exchange (ASX) for four hours due to a failed change implementation. An upgrade on the ASX's internal network ( to improve the latency of the trading platform) led to unprecedented connectivity issues between the supporting components and the disseminating gateways of the trading system. ASX had to initiate trading services from one of their disaster recovery sites. Finally, to restore normalcy, the change had to be backed out that night. Lack of relevant information such as the impact of the change, the dependencies of the assets involved, the change implementation window, and business priorities. Inability to collaborate between teams for successful change implementation. Improper communication to end users and stakeholders of the change implementation. Perform a proper impact analysis and a detailed rollout plan with a check list of tasks to be completed. Collect all relevant information from end users and technicians before the implementation. Constitute CABs and ensure a strict approval process. Another help desk metric that should be tracked to have an effective change management process is the number of unplanned changes. An unplanned change can be an emergency change or an urgent change. An emergency change: A service restoration change due to an incident, or a change that needs to be implemented quickly to avoid an incident. An urgent or expedited change: Changes that are required quickly due to a pressing need such as a legal requirement or a business need, but are not related to restoring service. Although there is no industry standard or defined number for the number of unplanned changes permissible in an IT infrastructure, this reporting metric is important, especially during an increasing trend or a spike in the number of unplanned changes. 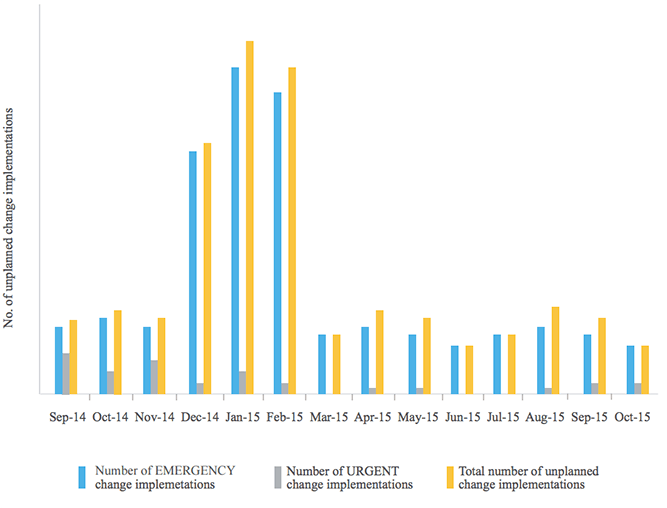 An increasing trend in the number of unplanned changes indicates the inadequate planning of changes and questions the efficiency of the change management process. Therefore, the change management process has to be improved to ensure proper planning and execution of changes. 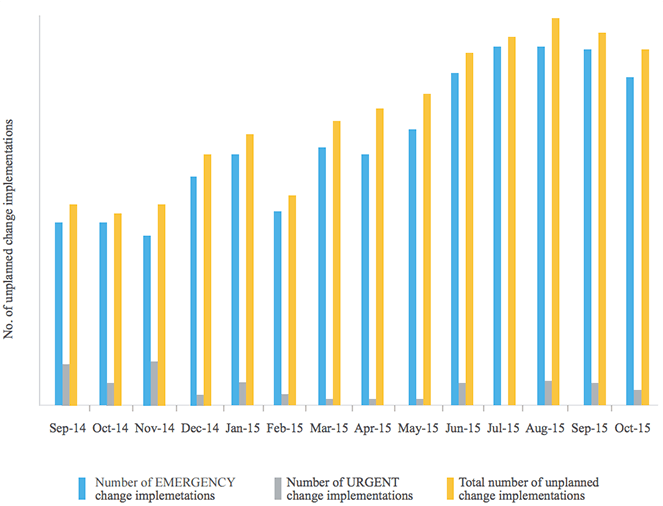 A sudden spike in the number of unplanned changes can be due to unanticipated major incidents, which warrant emergency changes to restore service. Such a situation is probably due to an unstable infrastructure, which could affect service availability and, ultimately, the business. Maintain a highly stable infrastructure. Delivering maximum availability and better service quality will be impossible in an infrastructure where routers have to be restarted multiple times a day, servers are often down, or workstations have to be rebooted every now and then. Therefore, such problematic assets must be identified and replaced to ensure business continuity. Number of problematic assets replaced at the end of the time frame. Another major indication of stability is the recurrence of major incidents on the IT infrastructure, which can lead to service disruptions or service level deterioration. A major incident, by definition, is a high-impact, high-urgency incident that affects a large number of users, depriving the business of one or two key services. 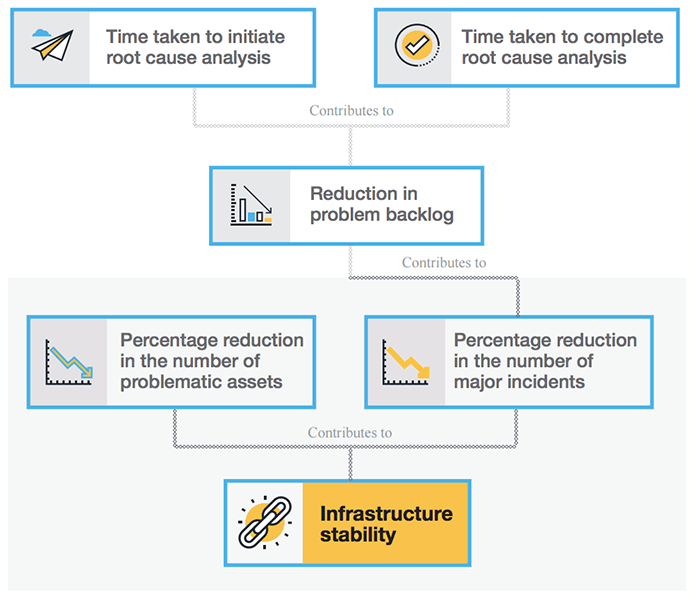 The goal is to reduce the number of major incidents, which can be achieved with efficient Root Cause Analysis (RCA) and a reduction of problem backlog. Identifying root causes and fixing problems can reduce the recurrence of major incidents and, subsequently, ticket volumes to the IT helpdesk. Faster initiation of RCA: In this case, the sooner the better. The sooner the RCA is initiated, the greater the chances are of identifying the root cause. Teams can also measure these action items with details on time taken to initiate root cause analysis after problem identification and time taken to complete root cause analysis. One of the world's leading financial institutions was able to improve its stability by reducing their major incidents. This reduction in the number of incidents was achieved by improving their root cause analysis process. Inconsistent quality of RCAs, and lack of proper documentation. Not effectively communicating the investigation process to the stakeholders. Having a dedicated problem management team with problem administrators and problem managers. Identifying and training subject matter experts. Training the problem management team on the basic and advanced root cause analysis techniques. 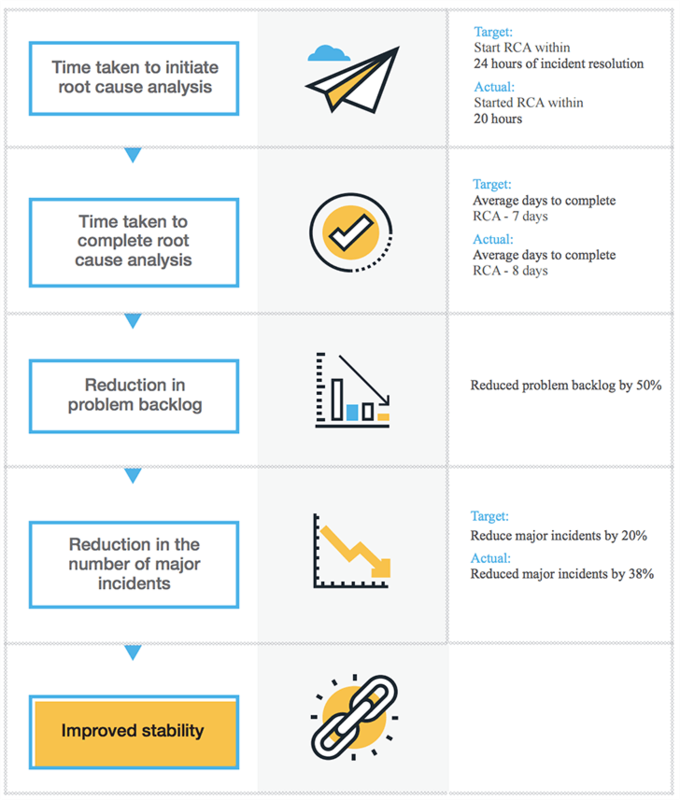 Working on these two simple ITIL service desk metrics-percentage reduction in the number of major incidents and percentage reduction in the number of problematic assets-can help you maintain a highly stable IT infrastructure. 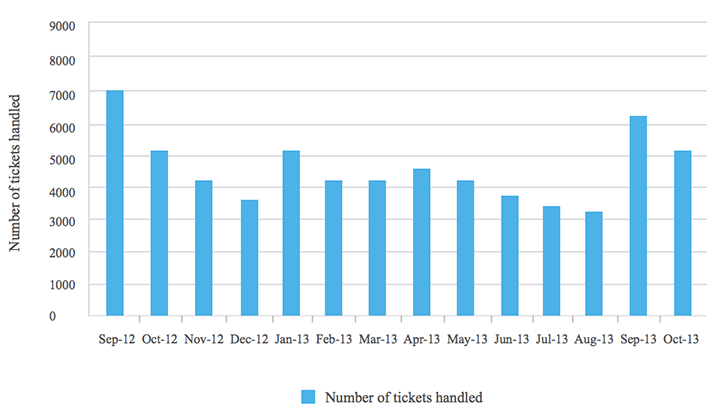 Total number of tickets handled by the IT helpdesk and their patterns within a given time frame. Optimize the number of incidents and service requests, and prepare the IT team to handle the ticket load. What can you do with ticket volume trends? Identify peaks and troughs to optimize resource management and technician workload. Create a better staffing model. Design training sessions for your IT service desk team. Analyze service request patterns and plan ahead for purchases of assets and licenses. Validate any additional resource requirements. As the business grows, it is obvious that the IT service desk has to support more end users, which typically leads to increased ticket volumes. This gradual increase in the ticket volume can be handled by an effective staffing plan in accordance with the growth of the business. Furthermore, end users can be segregated into departments and user groups to handle tickets effectively. 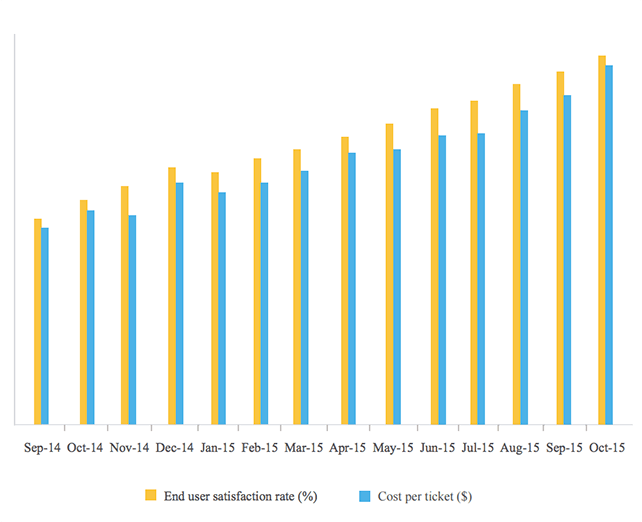 As IT starts supporting more business functions, the ticket volume (both incidents and service requests) rises. This can be handled by understanding the requirements and expectations of the end users, and equipping the IT help desk team to handle the increase in tickets. With the increasing number of problematic and outdated assets in the IT network, the number of tickets is bound to increase as well. This can be addressed by associating the incidents and problems with their assets, helping the IT team decide on retiring the asset, upgrading the assets, and so on. Have a higher level of FCRR. 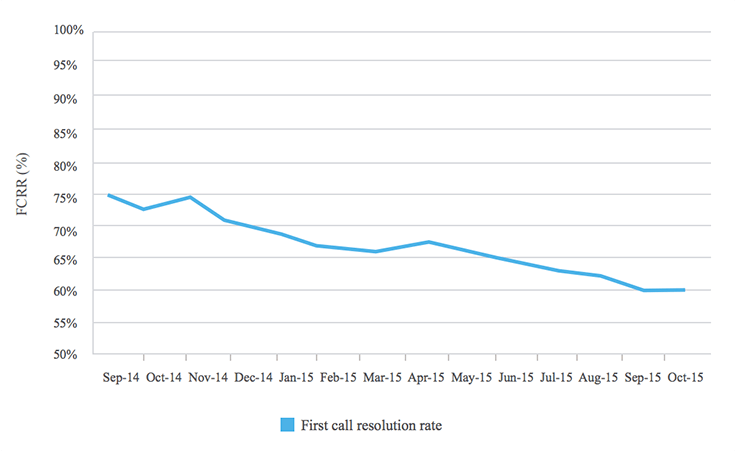 High first call resolution rate is usually associated with higher customer satisfaction as confirmed by a study that Customer Relationship Metrics conducted. Furthermore, a study conducted by the Service Quality Measurement Group also revealed that for every one percent improvement in FCR, you get a one percent improvement in customer or end user satisfaction. First call resolution is also related to cost per ticket. The following graph represents the cost per ticket for every level. Sometimes IT helpdesk technicians rush to close tickets during the first call, even without accurate resolutions. 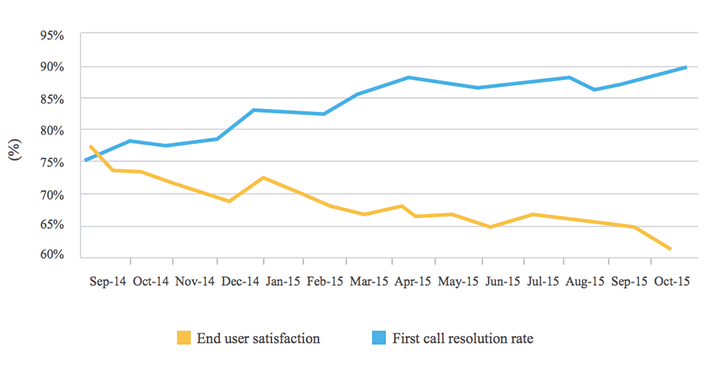 Such cases can lead to first call resolution rates rising, while end user satisfaction rates drop drastically, as depicted in the following graph. Here is a simple three-phase technique to get your IT help desk team resolving tickets in the first call. Populate the knowledge base with the information collected, creating relevant artifacts. Generate regular status reports on the IT help desk performance with sections on lessons learned, achievements, and obstacles overcome. Invite experts to evaluate performance. Create an operations manual that clearly outlines support processes, centralizes key environmental information, and explicitly defines complex procedures for ticket resolution. Generate reports to ascertain that the efforts of phase I panned out, and identify areas of improvement. Below are some sample reports to help you get started. Percentage of calls taken by each technician. Number of calls taken per agent, per hour. Average talk time, by agent. Of the tickets we did not close, where were they transferred? Of those transfer destinations, who received the most tickets? Establish a well-defined process for continual improvement of first call resolution rate. This technique not only helps you improve the FCRR levels, but also helps ensure that tickets are properly resolved, not just closed. Another possible trend is a constantly degrading FCRR, as shown in the following graph. Lack of requester and system information. Poor knowledge transfer and sharing. According to MetricNet's benchmarking levels, the average net FCRR for service desks globally is 74 percent, with a range of 41 to 74 percent. The most common factors among all the services on the higher end of the spectrum were the presence of highly trained agents, the availability of knowledge management tools, and the presence of tools such as remote desktop management. Communicate the importance of FCRR to the technicians. Design training programs for the first level technicians on specific subjects to help resolve tickets faster. Maintain a knowledge base of advanced technical solutions and articles exclusively for, and limited to, technicians. Create custom forms to collect all relevant information at the time of ticket creation to avoid turnaround delays. Automatically route tickets to the right technician or group based on ticket parameters. Maintain maximum SLA compliance rate. Ascertain that the service levels are real and obtainable. Identify areas of improvement, strengths, and weakness of the IT help desk. Sometimes IT help desk technicians close tickets without proper resolutions, just to avoid SLA violations. 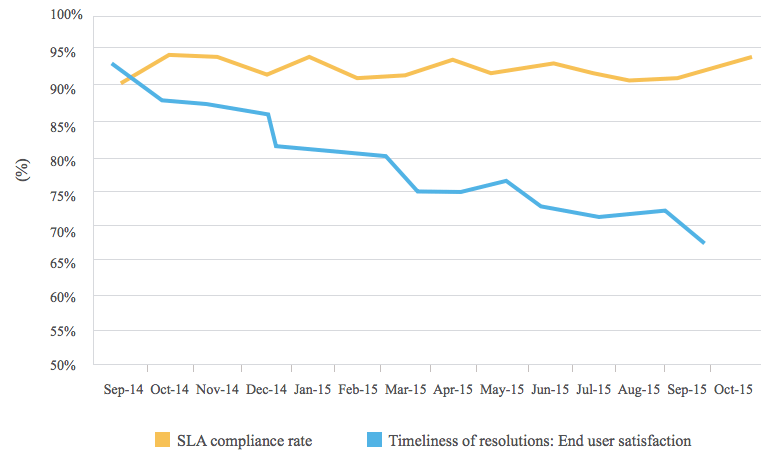 When this happens, though the SLA compliance rates remain high and the end-user satisfaction levels are bound to decrease, as shown in the following graph. Your team may not understand the business requirements, which can lead to service level agreements that don't fulfill the business needs, or improper categorization and prioritization of tickets leading to SLA violations. There is often a lack of proper communication on the risks of outages affecting mission-critical services and their business impacts. During such scenarios, IT service desk teams must understand the requirements of the business, and redefine their SLAs as appropriate. SLAs and SLA compliance are critical to ensuring business continuity. This case from a cement manufacturing company, however, stresses that SLAs must also be set carefully. The IT help desk was unavailable for immediate response to an issue on a truck dispatch, but did resolve it within the SLA. Unfortunately, the cement manufactured had to be dispatched to the client location within one hour to avoid hardening. The IT help desk was unaware of this, and SLAs were set without considering these factors. As a result, though the ticket was resolved within the SLA, the cement had already hardened, which affected the business. 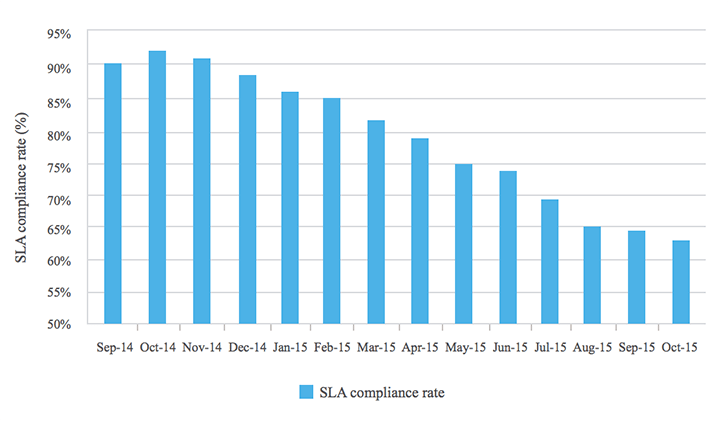 Another alarming trend to keep an eye out for is a constantly degrading SLA compliance rate. Lack of awareness of the SLAs and the risks of SLA violations. Absence of proper monitoring and proactive escalation. Unassigned tickets and delayed and faulty ticket assignments. Setting realistic SLAs based on the business requirements and IT capabilities. Communicating the SLAs and risks of SLA violations to the business and technicians. Automating the process of routing and assigning tickets. Designing training programs for your technicians. Maintain minimum levels of cost per ticket. As per MetricNet, the following were the cost per ticket benchmarks for 2014. As seen in both cases, the cost of the service request is usually higher than the cost of the incidents. This is because incidents typically take less time to resolve than service requests. So, the cost per ticket is heavily infl uenced by the mix of incidents and service requests. IT support is considered a cost center in most organizations, and is usually the first to get budget cuts during a financial downturn. Therefore, IT support must remain efficient, even when IT spending is reduced. 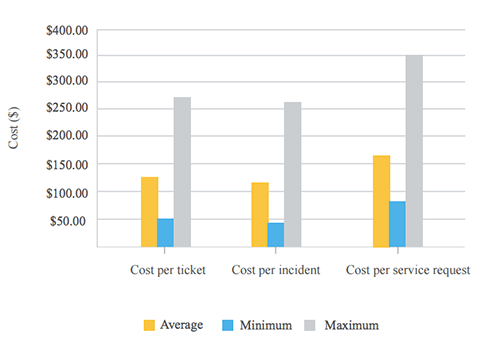 Cost per ticket is a key service desk performance metric that helps IT support analyze its efficiency in handling tickets within a given budget. The goal is always to maintain an optimal level of cost per ticket. 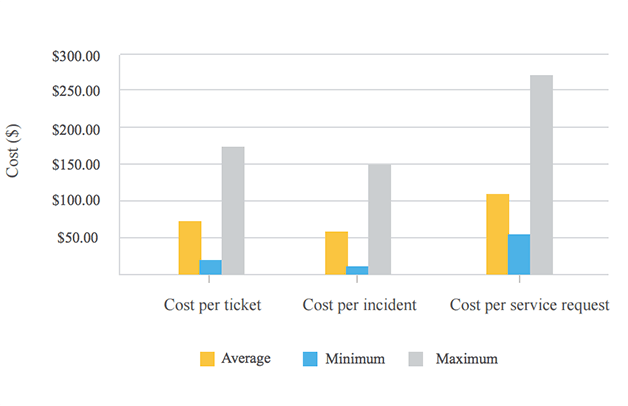 However, it is important to keep in mind that a higher-than-average cost per ticket may not necessarily be a bad thing, and a lower-than-average cost per ticket may not always be good, as shown in the following graphs. 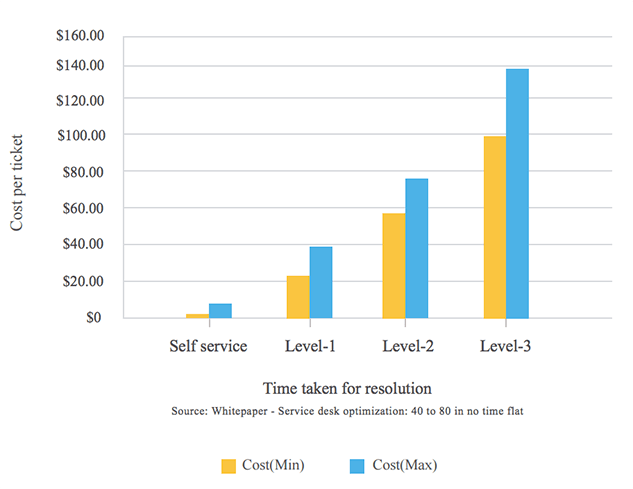 The scenario depicted in this graph may mean that the IT service desk team is compromising on service quality to reduce the cost per ticket, which often results in lower customer satisfaction levels. 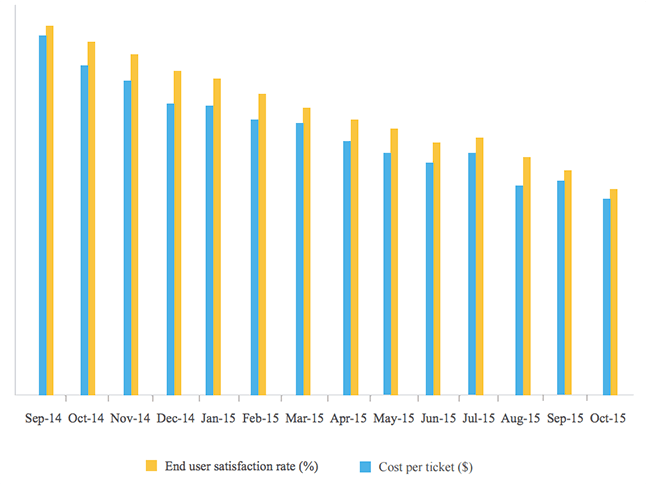 The scenario depicted in the above graph shows where the increase in the cost per ticket is accompanied by an increase in the customer satisfaction levels. This may mean that the increasing cost per ticket has led to better service delivery, justifying the extra cost. Analyze service request patterns to plan ahead for purchase of assets and licenses, reducing the time taken to close service requests. Identify peaks and troughs to optimize resource management and technician work load. Properly categorize and prioritize tickets to reduce incorrect ticket assignments, helping provide quick resolutions. Create a robust knowledge base. Maximize ROI (return on investments) on software investments. Category 1 - Software that needs the most attention (with the highest business implications, license cost, or compliance risks). Category 2 - Software that needs the least attention (free software such as Adobe Reader). Category 3 - Prohibited software and malware. This metric helps identify any software purchase expenditure that does not provide any value to the organization. Ideally, this ratio should be close to one, meaning there is maximum utilization of all purchased software, thereby ensuring a maximum ROI on the software license purchase. A high number of category one software in the unused list means that a major portion of the software asset spending is sitting in idle software. This metric helps analyze the license utilization of a particular software, helping IT teams plan ahead for license purchases. The ratio should be as small as possible for maximum ROI. A higher ratio could mean that some of the software applications are over licensed, which could be an idle investment with no ROI. A leading global pharmaceutical company saved about one million dollars in software license spending. The pharmaceutical company, with its services spread across 50+ countries, was using a diverse range of Microsoft products. At one particular office, there were thousands of software applications licensed under a Microsoft volume licensing agreement, but there was no visibility or control of these software assets, initially. The purchase had been made without understanding the business requirements. In fact, the company had limited information on the software assets and the number and type of assets the organization actually needed. This, again, put the organization at the risk of over-licensing, under-licensing, and compliance penalties. The IT help desk started with a simple analysis by comparing the installed Microsoft software with the Microsoft licenses they held. The insight gained, and IT's efforts to understand the business requirements, led to a redesigned Microsoft license purchase that involved stepping down from the Microsoft Office Professional edition to the cheaper standard edition, which met the business requirement. Furthermore, several other volume licenses were replaced, leading to cost cuts saving the company about one million dollars in their software license purchases. Track all software installations and license purchases. Allocate licenses to individual software installations to find the over and under-compliant software. Purchase the right license types for the software. For example, it is better to purchase a perpetual license for a core software to avoid compliance issues due to license expiry. Conduct formal internal assessments for compliance and audit readiness. Hundred percent license compliance rate will no longer be a myth with this simple three-step pre-audit. Request a list of all software applications licensed to your organization from the specific vendor. Identify and pin down software that is in use by the business, but not on the list provided by the vendor. 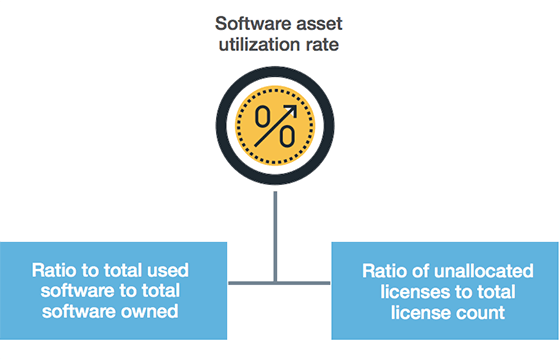 Check the total number of software installations vs. the total number of licenses purchased for every software application to identify over and under-licensed software. With all the insight gained from step I and II, redesign your software purchases to optimize compliance and attain a 100 percent license compliance rate. These 8 KPIs, with respective metrics, will help you establish a measurement engine to constantly measure and continuously improve your service desk performance. The first step in establishing this measurement engine is to understand the business that the IT help desk is supporting, and align the IT help desk objectives to the business objectives. The next step is to identify the KPIs and metrics that are critical to these help desk objectives, and constantly measure them. The 8 service desk KPIs discussed here are critical to the three basic IT help desk objectives of ensuring business continuity, making the organization productive, and delivering services within budgets and on time, which underlines the fact that these 8 KPIs are the ones that your IT help desk should care most about.